The Department of Environment, Land, Water and Planning (DELWP) is reviewing the institutional arrangements between Melbourne Water and Councils to better determine responsibility for urban stormwater flood management, related assets and services (including the 60 hectare threshold). 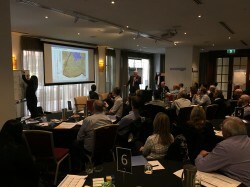 On Wednesday 31 May the Municiple Association of Victoria (MAV) held a half day forum to provide senior managers from Councils the opportunity to provide input into the scope of the review. This was also an opportunity to understand the issues and opportunities from a Council perspective. There was an excellent turn out to the event with over 50 Council representatives and a panel made up of MAV, Melbourne Water, Council and DELWP representatives. Highlights included Council appreciation towards Melbourne Water, DELWP and MAV for involving them early in the process. MAV will establish a working group over the next 18 months to continue to gain Council input into the process. This is a joint collaboration between DELWP, MAV and Melbourne Water.